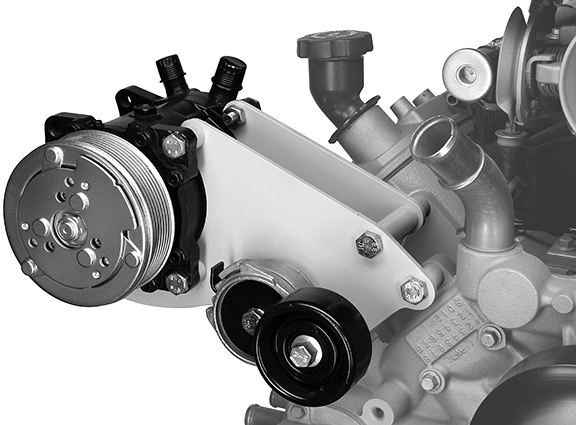 This bracket system is designed to mount an aftermarket Sanden A.C. compressor to the popular LS series truck engines utilizing the factory alternator and power steering pump accessories. Bolts to head and water pump. Works well in vehicles with low hood clearance -- Trucks, 50-60s cars, etc. 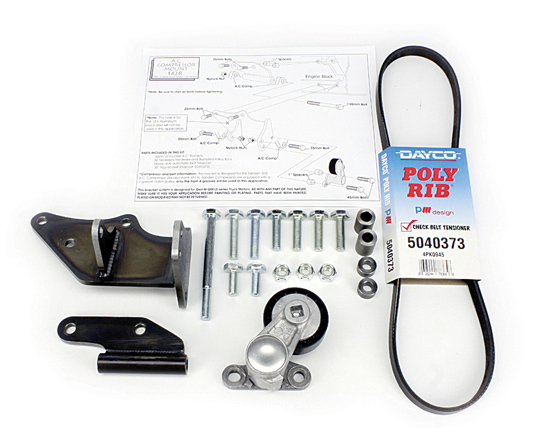 Bracket kit includes: Steel A.C. mounting brackets, mounting hardware, heavy duty automatic belt tensioner, Dayco six-rib drive belt and illustrated instructions for easy installation. Note: Check bracket and balancer dimensions below to insure propper fitment. 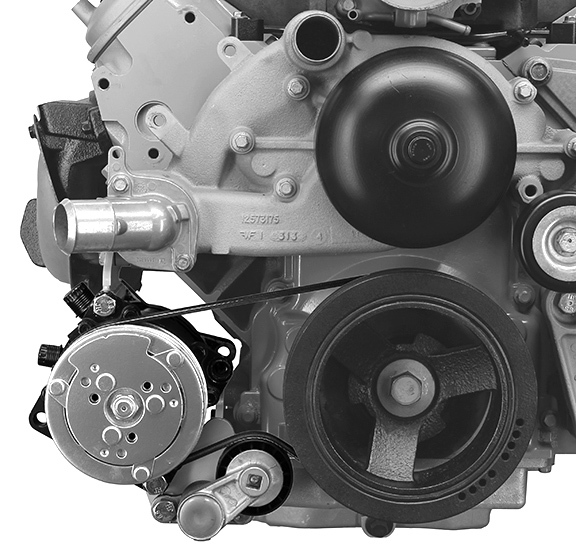 This bracket system is designed to mount an aftermarket Sanden A.C. compressor to the popular LS1 Camaro Firebird engines utilizing the factory alternator and power steering pump accessories. Bolts to head and water pump. Works well in vehicles with low hood clearance -- Trucks, 50-60s cars, etc. 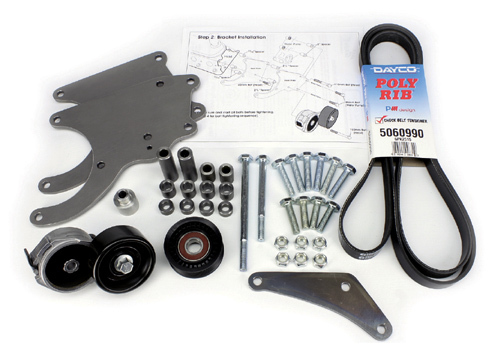 Bracket kit includes: Steel A.C. mounting brackets, mounting hardware, idler bracket and pulley, heavy duty automatic belt tensioner, Dayco six-rib drive belt and illustrated instructions for easy installation. 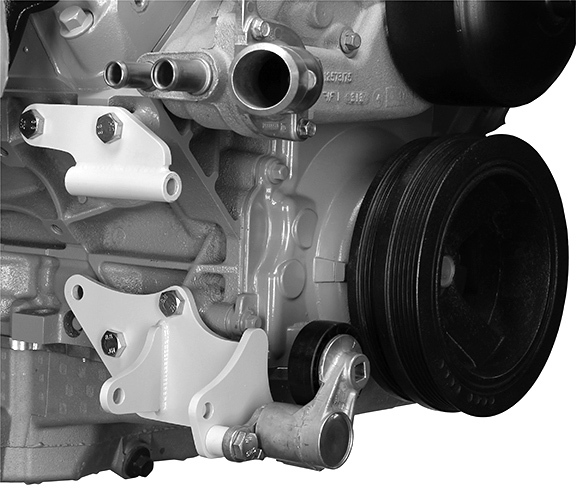 This bracket system is designed to replace the factory A.C. compressor with an aftermarket Sanden 508 compressor. 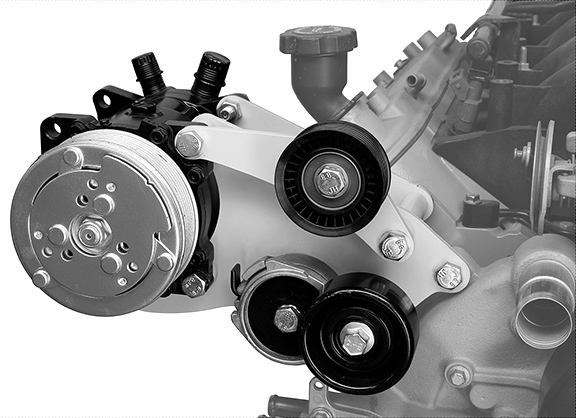 A.C. compressor is driven off the factory inner four grooves of the LS truck harmonic balancer. 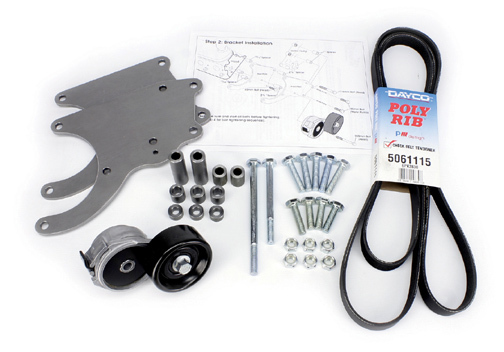 Bracket kit includes: Steel mounting brackets, mounting hardware, automatic belt tensioner, Dayco four-rib drive belt and illustrated instructions for easy installation. This bracket system is designed to replace the factory A.C. compressor with an aftermarket Sanden 508 compressor. 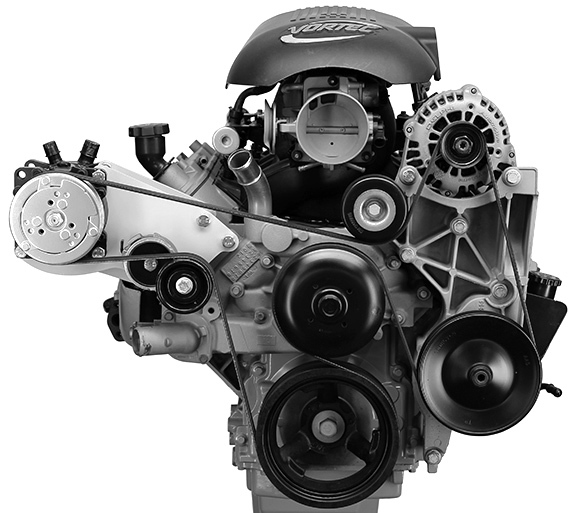 A.C. compressor is driven off the factory inner four grooves of the LS1 Camaro harmonic balancer. 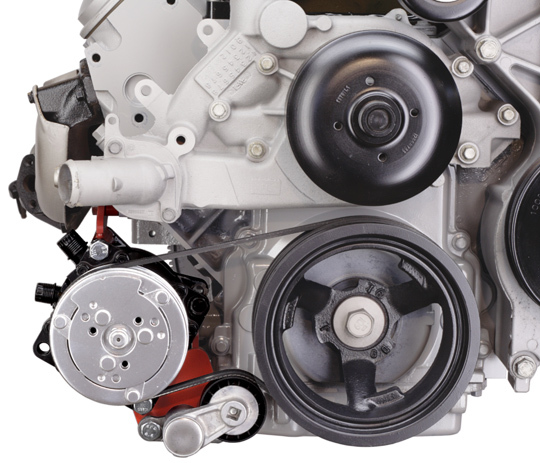 Bracket kit includes: Steel mounting brackets, mounting hardware, automatic belt tensioner, Dayco four-rib drive belt and illustrated instructions for easy installation. 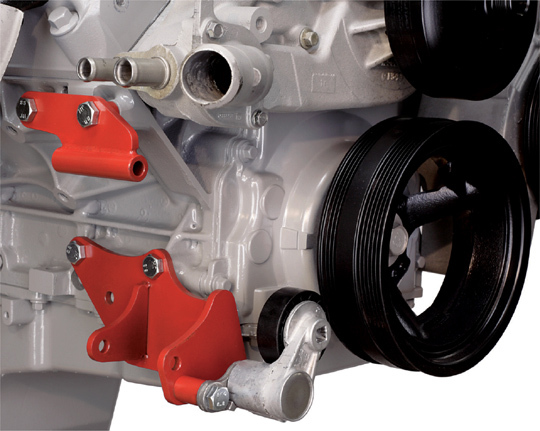 This bracket system is designed to replace the factory A.C. compressor with an aftermarket Sanden 508 compressor. 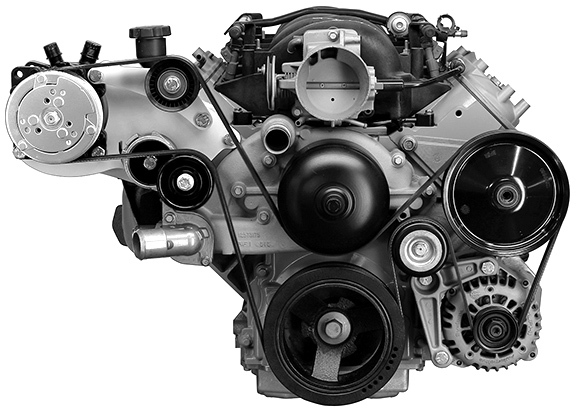 A.C. compressor is driven off the factory inner four grooves of the LS Corvette harmonic balancer. Bracket kit includes: Steel mounting brackets, mounting hardware, automatic belt tensioner, Dayco four-rib drive belt and illustrated instructions for easy installation. Note: May require motor mount modification due to severe setback of Comp. Note: May not work with LSA or LS9 supercharged applications.